I. 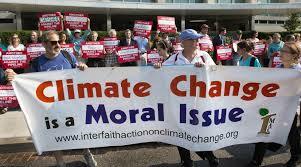 The Failure of Ethical Principles to Get Traction in Climate Change Policy Formation. This entry will explain why a type of rationality, referred to as instrumental rationality, both dominates policy formation on climate change around the world and is responsible for the failure of ethical principles to guide government responses to climate change. First, it is a problem that is being caused by some people in one part of the world who are putting others in other places who have often done little to cause the problem at great risk. Second, the harms to those at most risk are not mere inconveniences but potentially catastrophic harms to life and natural resources on which life depends. In fact, unless humans adequately respond to climate change’s growing threats, most of life on Earth is threatened. Finally climate change is a problem about which many of its greatest victims can do little to protect themselves by petitioning their governments for protection. The victims’ best hope is that the those high-emitting nations and people causing the problem will see that they have duties to climate change victims to avoid harming them. The ethical dimensions of climate change are important to understand because unless those nations and individuals that are emitting high levels of greenhouse gases (GHGs) reduce their emissions in accordance with their ethical obligations, climate change will eventually cause great harm to all but particularly to those who are most vulnerable to climate change impacts and who usually have done little to cause the great harm. In addition there are numerous other non-controversial ethical norms that are understood to apply to nations as a matter of international law to global environmental problems such as climate change including the “no harm principle” which obligates nations to prevent people or entities within their jurisdiction from harming people and nations outside their borders (UNFCCC,1992, Preamble), and the “polluter pays principle” which requires those nations causing harm from pollution to pay for the damages they cause (Rio Declaration, 1992, Principle 16). Yet most nations are completely ignoring these ethical obligations when they formulate policy responses to climate change (National Climate Justice. Lessons Learned). A research project led by Widener University Commonwealth Law School and the University of Auckland found that despite express national promises under the Paris Agreement to base national climate commitments known as Nationally Determined Contributions (NDCs) to reduce the threat of climate change to prevent warming as close as possible to 1.5°C but no more than 2°C, on the basis of equity and common but differentiated responsibilities, all 24 nations studied actually set their NDCs on economic self-interest. Yet this conclusion was not determinable from the documents that nations submitted to the UNFCCC Secretariat when the nations submitted their NDCs (National Climate Justice, Lessons Learned). The study also found that environmental NGOs in the country that supported national action on climate change did not seem to understand how to critique the failure of the nation to set its NDC on the basis of the nation’s ethical obligations including ethical obligations that the nation expressly agreed to. the nation’s fair share of global GHG emissions that may not be exceeded to keep global warming from exceeding a warming limit goal. Yet nations around the world are setting their NDCs on economic self-interest and ignoring their ethical responsibilities on these issues. There is a basic set of shared ethical premises and precedents that apply to the climate problem that can facilitate impartial reasoning that can help put bounds on the plausible interpretations of ‘equity’ in the burden sharing context. Even in the absence of a formal, globally agreed burden sharing framework, such principles are important in expectations of what may be reasonably required of different actors. (IPCC, 2014). The IPCC went on to say that these equity principles can be understood to comprise four key dimensions: responsibility, capacity, equality and the right to sustainable development (IPCC, 2014). And so ethical principles are failing to guide national climate change policy formation despite the uncontroversial applicability of several ethical principles that should guide national climate change policies. The failure of ethical principles to get traction in guiding policy is a much broader problem than in regard to climate change policy formation alone. Despite the emergence of the academic sub-discipline of environmental ethics in the late 1970s, ethical principles are failing to influence environmental policy-making for most environmental problems. The claim that ethical principles are rarely guiding environmental policy formation is strongly supported by the comments of the founder of the journal Environmental Ethics, Eugene Hargrove, who in 2003 published an essay “What’s Wrong ? Who’s to Blame? (Hargrove, 2003). This essay invited reflection on why environmental ethics has not had an influence on environmental policy. Just three years later, Robert Frodeman, in the same journal in an article entitled “The Policy Turn in Environmental Ethics” also reflected on the huge failure of environmental ethics to achieve traction in environmental policy formation (Frodeman, 2006). Since its inception in the late 1970s, academic environmental ethics has been mostly focused on theoretical issues while completely failing to help policy makers understand what is ethically wrong with specific arguments made by opponents of environmental policies who almost always use arguments derived from instrumental rationality which hide dubious unstated norms that are the justification for the arguments and which would often fail minimum ethical scrutiny if the norms were made express and critically reflected on. One of the reasons why ethical principles have failed to affect environmental policymaking is the failure of the academic discipline of environmental ethics to pay attention to actual controversies that arise in environmental policymaking debates. Academic environmental ethics since its inception in the late 1970s has been almost exclusively focused on theoretical issues, such as how to ground a biocentric or ecocentric ethics, while completely failing to help policymakers understand what is ethically wrong with specific arguments made by opponents of environmental policies who almost always rely on arguments derived from instrumental rationality which hide or ignore dubious unstated norms on which the arguments are based. 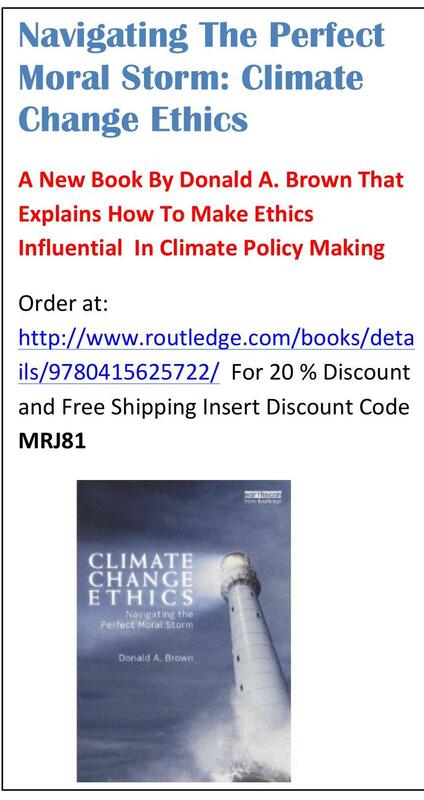 This article now explains why a first order task that needs to be addressed before ethical principles can play their appropriate role in shaping environmental public policy is to open policymaking arguments on environmental issues including climate change to express ethical reflection. This is a first order task because throughout the world those responsible for environmental policymaking are following instrumental reason, a mode of reason which hides or ignores ethical questions, to determine the acceptability of environmental policies. It is a first order problem because before one can consider what ethical principles should guide policy formation, policymaking must be made open to ethical critique and reflection. If policymakers don’t see and respond to the ethical issues that are implicitly raised by arguments raised against proposed policies, they can’t apply the appropriate ethical rules. 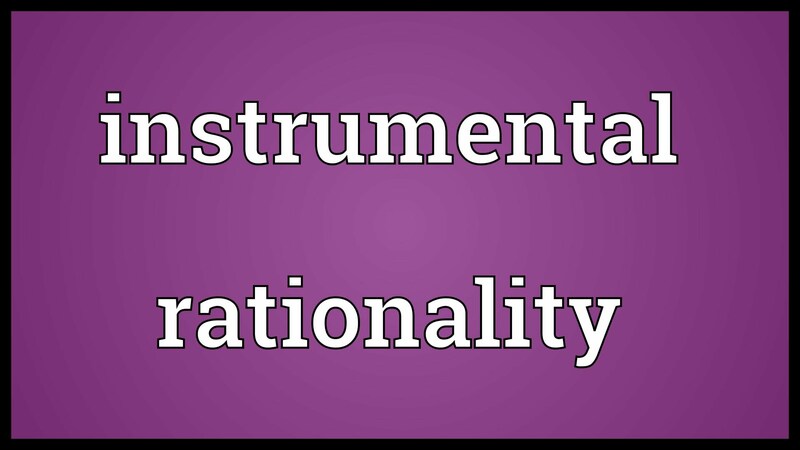 Instrumental rationality is a mode of rationality that is exclusively concerned with the search for efficient means or scientific facts which, consequently, is not concerned with assessing the goals—or ends— that policies should pursue. This form of rationality has existed throughout history, but has become increasingly more dominant in post-Enlightenment liberal democratic capitalist societies (Cruickshank,2014). Ethics rationality, on the other hand, is concerned about what the goals of society should be. Ethical reasoning seeks to determine what should be the goal of human behavior by examining what is right or wrong, what is permissible or impermissible, what actions are obligatory or non-obligatory, and how burdens of preventing harm should be justly distributed. Instrumental rationality, because it focuses on means, usually ignores ethical questions about what the goals of policy should be despite the fact that every argument against a proposed environmental policy already contains an unstated norm. For instance, a claim that a proposed climate change policy should not be adopted because it imposes unacceptable costs rests on the unstated norm that the government should not adopt policies that impose significant costs on the economy or specific industries. Scientific and economic reasoning, which have increasingly dominated public policy-making from the beginning of the Enlightenment, almost always focuses on how to achieve goals, not on what goals or ends should be desired. Economic rationality often focuses on how to maximize human preferences. Ethics asks a different question of economic activity, namely what preferences humans should have. Scientific reasoning usually tests hypotheses to determine what “is.” Moral philosophers believe that determining what “is,” which is the proper domain of science, cannot determine what “ought” to be, which is the domain of ethics. Yet instrumental rationality that scientists and economists deploy in their search for scientific and economic facts has dominated public life and higher education for several centuries. That instrumental rationality dominates environmental policy making is clear given that most government environmental agencies are staffed exclusively by engineers, scientists, economists, and lawyers but very infrequently by employees trained in ethics. This is huge problem because very few employees of environmental agencies or scientific organizations that make policy recommendations can spot problematic ethical issues that should be acknowledged in policy debates and particularly ethical issues that are ignored or hidden when instrumental rationality is deployed to make policy recommendations. Although employees of government agencies responsible for policy formation often understand they should apply policy rules entailed by relevant laws, many relevant laws do not contain clear rules on how to respond to economic and uncertainty arguments against proposed environmental policies. First, sociologists, including Max Weber, have predicted that instrumental rationality would over time crowd out ethical rationality in modern societies because increasingly complex human problems would be relegated to bureaucracies run by technical experts whose expertise depends on the use of instrumental rationality. Since the power of experts depends, in part, on maintaining the fiction that their expertise is the central key to solving modern problems, these experts are reluctant to acknowledge that their analytic tools for solving problems are often ethically inadequate and sometimes ethically inappropriate (Thomas, 2017). Moreover particularly in capitalist societies, wealthy interests are able to hire experts and frequently do so to fight government action which would reduce profits. Second, opponents of proposed environmental policies usually frame opposition to these policies on the basis of excessive costs to governments or specific industries or lack of scientific certainty about harms the policy seeks to prevent. These arguments very frequently hide controversial normative assumptions implicitly embedded in the arguments. For instance, cost arguments made in opposition to environmental policies often rest on the very ethically dubious idea that any policy which creates significant cost to a nation, regional economy, or to a specific industry should not be adopted even when the problematic behavior causes serious harm to people or nations who have not consented to be harmed. The public debate in response to these claims often narrowly focuses on the magnitude of the costs or whether the regulatory action will create jobs and in so doing ignores several serious ethical problems with these arguments. In policy disputes about matters in which potential harms are acknowledged by opponents of proposed policies, the public debate about the acceptability of the harms is often limited to some form of “cost-benefit analysis”(CBA). Potentially but not fully proven catastrophic harms were ignored in the CBA. The costs of taking action would be imposed upon parties that are harming others, yet the victims of the harm have not consented to be harmed. Things that were believed to be sacred by one culture are valued in the CBA as if they were commodities whose value can be measured adequately by “willingness-to-pay” monetary measures. CBAs usually commodify all human values and thus value is restricted to monetary value while ignoring other values including sacred value or beliefs that certain entities should not be for sale. Thus in CBAs, usually the value of things that could be harmed are measured by human preferences measured in monetary values. Yet ethics is concerned with what preferences people should hold, not simply what preferences people hold. Human rights will be violated if regulatory action is not taken. The proposed government action implements the ethical duty of people to not harm others on the basis of self-interest. The CBA determined economic value of entities that might be harmed are determined without obtaining the consent of those who might be harmed. The benefits of government action to protect the environment are discounted too greatly in calculations that seek to allow future benefits of action to be compared to current costs to those who must act to prevent harm (Brown, 2008). Thus, if a decision to take no government action on a potential environmental problem is justified only as a matter of imbalance between costs and benefits, very dubious ethical assumptions are frequently hidden in the CBA calculations while ethical principles, including those that have been widely acknowledged as valid and applicable to government policy formation are often ignored. In this writer’s experience, proponents of environmental policies also not only rarely identify the ethical problems with the use of CBAs or almost any cost-based argument made in opposition to proposed policies, they almost always respond to the cost-based arguments by making counter cost claims. And so public debate about proposed policies usually focuses on economic “factual” claims while ignoring ethical principles. 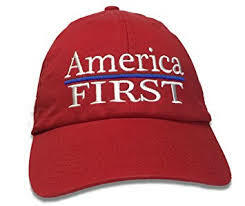 Evidence of the utter dominance of instrumental rationality in the United State includes executive orders of several US presidents which require that any US proposed regulation must satisfy a CBA before it may be promulgated (Congressional Research Service, 2017). This is so despite the fact that, as we have seen, a CBA used as a prescriptive guide to policymaking often hides many controversial ethical issues including, for instance, the duty of nations to not harm others on the basis of national economic self-interest. Using cost to those causing harm to others as justification for failing to abate the harm also violates well-established principles of international environmental law including the “polluter pays principle” (Rio Declaration,1992, Principle 16 ) and the “no harm principle.” (UNFCCC,1992, Preamble).. Yet the United States continues to very frequently base the acceptability of environmental regulations on the results of a CBA. In 1997, while working as the Program Manager for United Nations Organizations in the US Environmental Protection Agency (EPA) Office of International Affairs, this author closely observed the US debate about whether the US should agree to the Kyoto Protocol under the UNFCCC. This debate focused exclusively on two different CBAs, one completed by the US EPA and the other by the US Department of Energy which reached slightly different conclusions about the magnitude of negative impacts on US GDP if the US agreed to be bound by the Protocol. Amazingly both CBAs examined costs and benefits to the United States alone if the United States ratified the Kyoto Protocol while completely ignoring potentially harsh climate impacts on poor people around the world and the most vulnerable nations. Yet no one in the US government nor NGOs participating in the debate about whether the US should ratify the Kyoto Protocol raised any ethical problems with the US reliance on CBAs that examined costs and benefits to the US alone as a tool to determine the appropriateness of US action on climate change. In most Western capitalist countries, corporations and their industry associations have huge political power to frame public policy questions and don’t hesitate to exercise their power to prevent any government action that could lower corporate profits. And so the public debate on proposed policies often focuses on economic “facts,” not ethical duties, despite the almost universally accepted ethical norm agreed to by almost all religions and nations that people should not harm others on the basis of self-interest. Opposition arguments against proposed environmental policies often rest on the unstated very dubious norm that regulatory action limiting commercial activities should not be taken unless the harms are proven by the government with high degrees of scientific certainty even in cases where achieving high levels of certainty is scientifically difficult or very prohibitively expensive. For over 30 years, opponents of US action on climate change have frequently based their opposition on scientific uncertainty about human-caused climate change harms despite the fact that the United States agreed to the “precautionary principle” when it agreed to the UNFCCC in 1992. (UNFCCC. 1992, Art 3.3) This principle says that governments will no longer fail to take action on the basis of scientific uncertainty. Yet advocates of national action on climate change in response to opponents’ scientific uncertainty arguments almost always simply claim that the scientific “facts” of harm have been sufficiently scientifically demonstrated not on the ethical rule that precaution is required once it is scientifically established that significant harm might be created by certain human activities. The government assumes that the proponents of government action to prevent environmental harm should shoulder the burden of proof of demonstrating harm particularly in matters where proof is very expensive, difficult to demonstrate, or cannot be fully demonstrated before potential harms are experienced.. There is credible but uncertain evidence that the current activity may be approaching thresholds that could trigger very serious consequences. If the government waits until all uncertainties are resolved it will be too late to prevent serious harm. Some very serious potential harm is judged to be low probability just because the mechanism for causing serious harm is not completely understood so that the probability of the serious harm cannot be confidently evaluated. The victims of potential harm have not consented to put at risk. All of these considerations are relevant to climate change yet, the United States has failed to decisively act on climate change since international climate change negotiations began 30 years ago because opponents of US climate change policies have claimed that there is insufficient proof of human-induced climate change caused harms. Although the most prestigious scientific institutions in the world including most national academies of science and the Intergovernmental Panel on Climate Change have concluded with high levels of confidence that humans are causing and threatening great harms from human-induced climate change, even conceding, for the sake of argument, that great harms from human induced climate change are not yet proven, ethical principles requires that action should be taken to reduce the threat of climate change. Yet the ethical basis for requiring action is almost never discussed in the US public debate about whether scientific uncertainty about human-induced climate change is an appropriate justification for US unwillingness to act on climate change. Scientists employed by environmental agencies usually focus on understanding the environmental harms and risks of various human activities and whether proposed government action will acceptably reduce threats to human health and the environment. The goals of environmental regulatory action are usually given to them by law or regulation such as water pollution should be reduced to prevent unreasonable harm to humans or ecological systems. Yet, in the face of scientific uncertainty about whether human actions may cause harm, scientists cannot determine who should have the burden of proof or what quantity of proof should satisfy the burden of proof by scientific methods alone because these are fundamentally ethical questions. 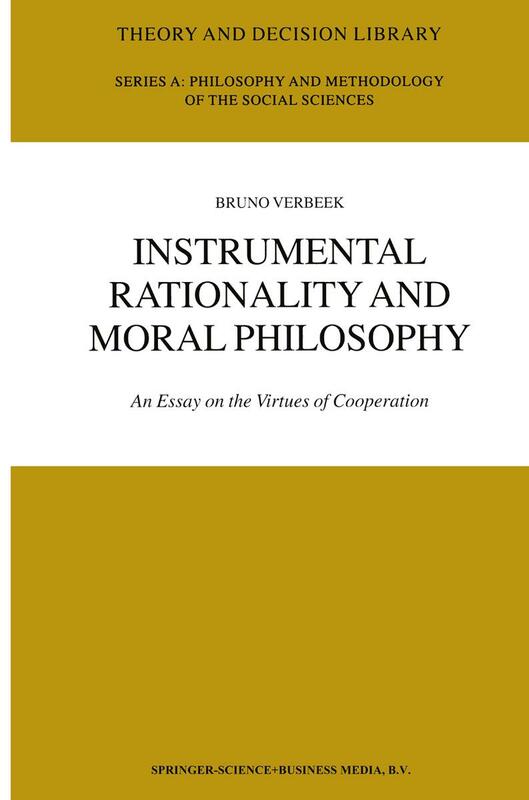 An understanding the ethical problems with instrumental rationality leads to an understanding of why nations often ignore even well-established ethical principles in policy formation such as the ethical principle that no nation should harm others outside their jurisdiction on the basis of national economic interest. For this reason, a first-order problem on the road to a world which formulates policies guided by ethical principles is to open policy formation controversies to express consideration of ethical issues. This goal requires that those engaged in policy formation spot and identify the ethical issues frequently hidden in economic and scientific arguments against proposed policies that currently dominate policy formation controversies on environmental issues around the world. Unfortunately most professionals engaged in environmental policy formation have no training that would help them identify the hidden ethical issues embedded in arguments made against environmental and sustainable development policies. Nor do those NGOs who participate in controversies about these issues have the training to spot ethical problems made by opponents of proposed policies that are derived from various forms of instrumental rationality. 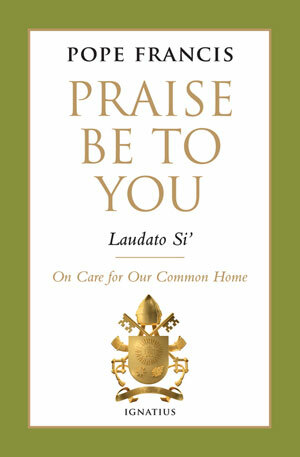 United Nations Framework Convention on Climate Change (UNFCCC, 1992), FCC/INFORMAL/84/Rev.1 GE.14-20481 (E), Preamble. Do US GHG Emissions Commitments Pass Ethical Scrutiny? Although the Obama administration has over the last year or two taken significant steps to reduce US greenhouse gas (ghg) emissions that have been widely welcomed by many nations, do the current US ghg reduction targets represent the US fair share of safe global emissions? This post examines the question of whether the current US commitments to reduce US ghg emissions are adequate as a matter of justice and ethics. On November 11, 2014, the Obama Administration announced a new US commitment on reducing its ghg emissions in a deal with China. (US White House, 2014) The United States pledged to cut its emissions to 26-28% below 2005 levels by 2025 while retaining a prior pledge to reduce US ghg emissions by 80% below 2005 by 2050. All nations have agreed to negotiate a new climate agreement with binding force at the twenty first Conference of the Parties (COP21) under the United Nations Framework Convention on Climate Change (UNFCCC) in Paris in December 2015. To prepare for the Paris negotiations, countries have agreed to publicly outline what post-2020 climate actions they intend to take, known as their Intended Nationally Determined Contributions (INDCs). The INDCs will largely determine whether the world is on a path to avoid catastrophic climate change by avoiding additional warming of no more than 2°C. The US March announcement on its reduction targets for 2025 was met with mostly, but not uniformly, positive responses from nations around the world because the new commitments were a significant increase over the US commitment made in 2009 to reduce US ghg emissions by 17% below 2005 emissions levels by 2020. The new US commitments were also welcomed because the United States has a record that spans several decades of being a major obstacle to achieving an adequate global solution to climate change. (For a discussion of the role that the United States has played in international climate negotiations, see Brown, 2002 and Brown, 2012) The Obama administration ghg reduction targets were seen by many as a constructive change in the US role in international efforts to find a global solution to climate change. Although there has been a positive response to the Obama commitments to reduce US ghg emissions, there is also great international concern that national INDCs, including the US commitments, are not nearly ambitious enough to prevent dangerous climate change. In fact there is a strong consensus among nations that unless nations reduce their ghg emissions to levels that represent each nation’s fair share of safe global emissions, there is little hope of preventing catastrophic warming. The United States along with almost every country in the world agreed when it ratified the UNFCCC to adopt policies to prevent dangerous anthropogenic interference with the climate system on the basis of “equity” and “common but differentiated responsibilities.” Thus the United States has agreed that it should reduce its ghg emissions to levels required of it on the basis of equity and justice. In addition there are several features of climate change that scream for attention to understand it and respond to it as an ethical and moral problem. These features include: (a) it is a problem caused by some nations and people emitting high-levels of ghgs in one part of the world who are harming or threatening tens of millions of living people and countless numbers of future generations throughout the world who include some of the world’s poorest people and who have done little to cause the problem, (b) the harms to many of the world’s most vulnerable victims of climate change are potentially catastrophic, (c) many people most at risk from climate change often can’t protect themselves by petitioning their governments; their best hope is that those causing the problem will see that justice requires them to greatly lower their ghg emissions, and, (d) to protect the world’s most vulnerable people, nations must act quickly to limit their ghg emissions to levels that constitute their fair share of safe global emissions. A major significance for policy of understanding climate change as a moral and justice issue, is that nations may not look at economic self-interest alone in formulating policies, they must consider their ethical and moral obligations to those who are most vulnerable to climate change. what is required of nations who fail to fulfill and protect human rights of citizens (For discussion of the implications for policy of a human rights approach to climate change policy see, Brown and Brown, 2014). And so although it may not be possible to say precisely what equity requires of nations in advance, strong arguments can be made that some national commitments fail to satisfy reasonable interpretations of what equity requires. Or saying this another way, although policy makers may disagree on what perfect justice requires, they may all strongly agree that certain positions are unjust. In the absence of a court adjudicating what equity requires of nations in setting their national climate change commitments, a possibility but far from a guarantee under existing international and national law (for an explanation of some of the litigation issues, Buiti,2011), the best hope for encouraging nations to improve the ambition of their national emissions reductions commitments on the basis of equity and justice is the creation of a mechanism under the UNFCCC that requires nations to explain their how they quantitatively took equity into account in establishing their INDCs and why their INDC is consistent with the nation’s ethical obligations to people who are most vulnerable to climate change and the above principles of international law. B. 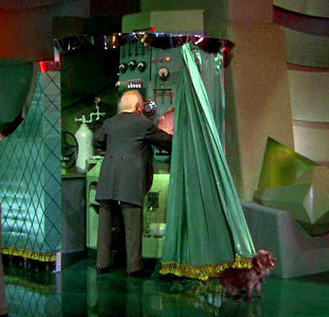 The US Justification for Its GHG Emissions Reduction Targets. Although the United States asserted without explanation when it submitted its INDCs to the the UNFCCC Secretariat that the US commitments were” fair and ambitious,” (US, 2015), the United States has also acknowledged the commitment was based upon what is achievable under existing US law rather than what may be required of the United States by ethics, justice, and basic fairness. The US has not asserted that the 26% to 28 % reduction below 2005 emissions reduction commitment by 2025 or 80% reduction below 2005 emissions by 2050 aspiration represents the US fair share of safe global emissions. Although it is speculation, it would appear that the reference by the United States to an 80% reduction commitment by 2050 originally made to the G8 was influenced by a 2007 report by the Intergovernmental Panel on Climate Change (IPCC, 2007, p776) which concluded that developed nations needed to reduce ghg emissions by 25% to 40% below 1990 emissions levels by 2020 and 80% to 95% by 2050 for the world to have any reasonable chance of limiting warming to 2°C. If this is the case, the US government has not explained why the US believes it need only achieve the lower end of the 80% to 95% reduction goal for 2050 emissions for developed nations identified by the IPCC in 2007 nor why the current reduction commitment of 26% to 28% below 2005 emissions by 2025 is justified given the much higher 25% to 40% reduction targets by 2020 were recommended by the IPCC in 2007 for developed nations. It would also appear when determining any of its ghg commitments that the United States has not considered the most recent carbon budget identified by the IPCC’s 5th Assessment Report. (IPCC, 2013, p27). A carbon budget is a limit of total ghg emissions for the entire world that must constrain total global emissions to have any reasonable hope of limiting warming to 2°C or any other temperature limit. 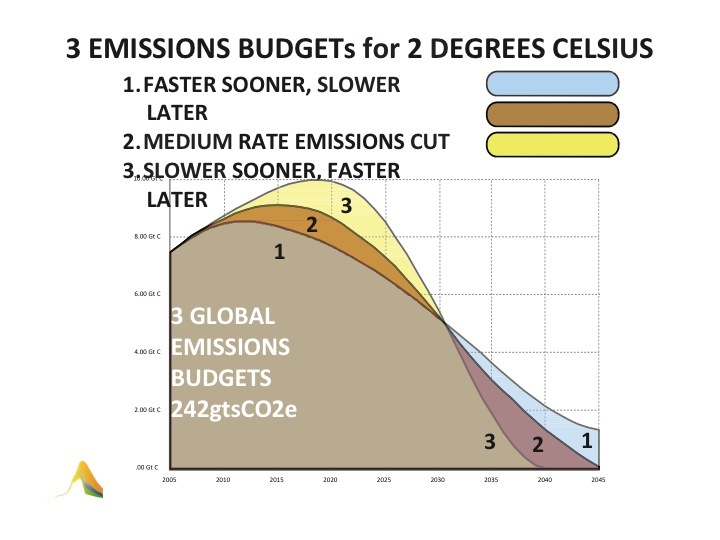 The IPCC budget defines a limit of future carbon emissions of approximately 270 gigatonnes carbon (GtC) to have a 66% chance of limiting the warming to 2°C. (Pidcock, 2013). The 2°C warming limit has been agreed to by the international community including the United States as necessary to prevent potentially catastrophic climate change. The US has agreed several times, including in the G8 agreement above, on the need for it to adopt policies that will, working with others, prevent warming from exceeding the 2°C warming limit. Because any US ghg target is implicitly a position on the US fair share of safe global emissions, any US emissions reduction target may only be justified as a matter of ethics and justice by explaining why the US commitment is a fair share of an acceptable global carbon emissions budget. Yet, the Obama administration has made no attempt to explain or justify why its emissions reduction goals are just and equitable in reference to a global carbon budget or a warming limit. As we have seen, the United States has asserted that its INDC is ambitious and fair but has given no explanation of how the United States justified this conclusion. 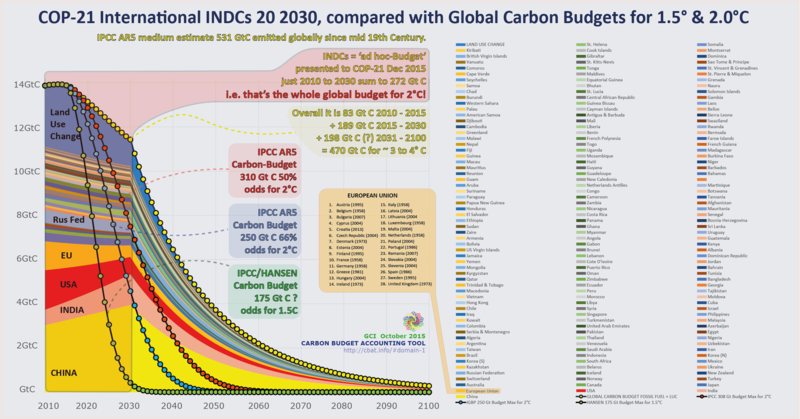 If the total carbon budget to give the world a 66% chance of keeping warming below 2°C is 270 gigatons carbon (GtC), then because the US population is 5 % of world population, a case can be made that the United States carbon budget must be below 13.5 GtC even before this number is adjusted on the grounds of fairness or equity that takes into account the US’s world leading share of historical emissions. Because the US is currently emitting 1.44.GtC per year, the US will have zero emissions to allocate to itself in 9.4 years at current emissions rates. In any event the US INDC, as well as all INDCs, should be expressed as a total number of carbon tons rather than as a percent reduction by a specific year given that a carbon budget requires nations to fairly allocate the remaining carbon budget necessary to limit warming to 2°C. Because keeping global emissions within a global carbon budget requires all nations to live within their allocated budget for the entire period, the US commitment should identify the total number of tons as a percentage of the global carbon budget it is allocating to itself. This is so because identifying a percentage reduction by a date in the future would not prevent a nation from far exceeding its budget allocation before the target date even if the percent reduction committed to is achieved by the target date. For this reason, nations should express their INDCs for emissions reductions in tons rather than in percent reductions by a specific date. Although President Obama thus acknowledged US responsibility to the world to take effective action on climate change, the US has not explained how this responsibility is linked quantitatively to any US ghg reduction commitment. There are several reasons for concluding that the US INDC fails to pass minimum ethical scrutiny. Second, the US has admitted that its commitment on its 2025 emissions reductions of 26% to 28% is simply based on what is achievable under existing law not what is required of the US as a matter of justice. 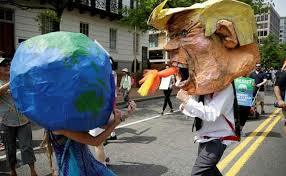 Third the debate about climate change in the United States for over 35 years reveals that opposition to stronger policies to reduce US ghg emissions has successfully blocked stronger US policies by making two kinds of arguments. The first argument has been that there is insufficient scientific certainty about human causation of harmful climate change to warrant climate policies given the likely costs of climate change policies to certain sectors of the US economy. The second argument which has blocked stronger US climate change policy for the last few decades is based on claims that proposed climate law and policies would impose unacceptable costs on the US economy. The cost arguments have taken several forms. (Brown, 2012b, p57) These arguments have included that proposed policies would destroy jobs, reduce US GDP, damage specific industries such as the coal and petroleum industries, increase the cost of fuel, or simply that proposed climate policies and legislation are unaffordable. (Brown, 2012b, p57). It is therefore clear that the actual basis for current US positions on climate change have not been identified by the the Obama administration, which likely is doing as much as it can under existing law. Rather the actual basis for current US climate policies includes arguments which have successfully prevented the US Congress from passing more ambitious US climate change policies. Therefore in the US, to determine the actual reasons for domestic action on climate change it is not sufficient to examine the claims of the administrative branch of government alone, one must examine the arguments made by opponents of climate change that have successfully blocked stronger climate change action by the government. And so, one cannot escape the conclusion that the basis for the US commitments on climate change include alleged unacceptable costs of more aggressive climate change policies to the US economy, matters of economic self-interest rather than global responsibility. Although both the scientific uncertainty and cost arguments made in opposition to US climate law and policies can be shown to be ethically problematic because they ignore US ethical obligations to others (see Brown, 2012b, pp57–137), these arguments neither have been examined in the US press nor identified by the US government. With very few exceptions, the US press has utterly failed to cover climate change as an ethical and moral issue while focusing on the scientific and economic arguments against taking action that have been made by opponents of US climate change policies for almost 30 years. 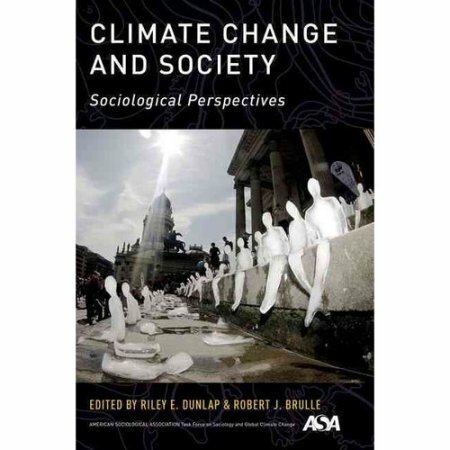 (Brown, 2009 ; Brown, 2012a) By focusing on the cost issues to the US economy, the US press has reinforced the ethically problematic notion that cost to the US economy alone is an acceptable justification for inaction on climate change. 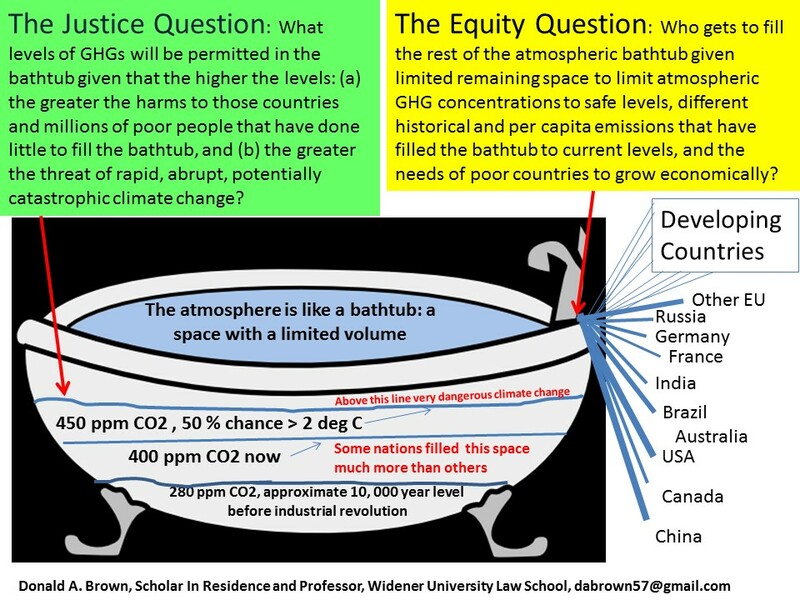 As explained above, the United States government has not explained how the US ghg emissions reduction commitments took into consideration justice and equity issues in establishing US emissions reduction targets. Although the Obama administration is likely doing as much as it can under existing law, it would have to admit that its current commitments do not represent the US fair share of safe global emissions. Reasonable arguments can be made about which of the equity frameworks that have attracted international attention and respect should be applied to any nation’s INDC. An examination of the arguments for and against specific equity frameworks that have received international attention and respect is beyond the scope of this article. (For a discussion of the merits of various equity frameworks see, Brown, 2014) However, it is not necessary to agree on an equity framework to conclude that some national commitments fail to pass minimum ethical scrutiny. As we noted above it is not necessary to know what perfect justice requires to spot injustice. The US current ghg emissions reductions commitments clearly fail to pass minimum ethical scrutiny for reasons stated here and summarized below. The United States had an opportunity to explain its justification for why its INDC was fair and sufficiently ambitious when it submitted its INDC. In fact the decision at COP 2o in Lima in December of 2014 encouraged the United States and all countries to explain why its INDC was fair and sufficiently ambitious to prevent dangerous climate change. The United States chose not to do this. In summary, a strong case can be made that the US emissions reduction commitment for 2025 of 26% to 28% clearly fails to pass minimum ethical scrutiny when one considers: (a) the 2007 IPCC report on which the US likely relied upon to establish a 80% reduction target by 2050 also called for 25% to 40% reduction by developed countries by 2020, and (b) although reasonable people may disagree with what “equity” means under the UNFCCC, the US commitments can’t be reconciled with any reasonable interpretation of what “equity” requires, (c) the United States has expressly acknowledged that its commitments are based upon what can be achieved under existing US law not on what is required of it as a mater of justice, (d) it is clear that more ambitious US commitments have been blocked by arguments that alleged unacceptable costs to the US economy, arguments which have ignored US responsibilities to those most vulnerable to climate change, and (e) it is virtually certain that the US commitments can not be construed to be a fair allocation of the remaining carbon budget that is available for the entire world to limit warming to 2°C. Brown, B. and Brown, D. (2015) Commonly Unrecognized Benefits of a Human Rights Approach to Climate Change, in L.Westra, C. Gray, and V. Karageorgou (eds.) Ecological Systems Integrity: Governance, Law, and Human Rights, Earthscan Routledge, in press. Brown, D. (2009) ‘The most crucial missing element in U.S. media coverage of climate change: The ethical duty to reduce GHG emissions’, ThinkProgress, 14 August 2009, http://thinkprogress.org/climate/2009/08/14/204506/media-climate-ethics-reduce-ghg-emissions/, accessed 22 July 2014. Brown, D. (2012b) ‘Navigating the Perfect Moral Storm: Climate Change Ethics in Light of a Thirty-Five Year Debate’, Routledge-Earthscan, New York. Light, A. (2014) Communication with Donald A. Brown in response to question about the justification for US position. Obama, B. (2014) ‘Remarks by the President on Climate Change’, Georgetown University, White House Press Office, 25 June, http://www.whitehouse.gov/the-press-office/2013/06/25/remarks-president-climate-change, accessed 22 July 2014. United Nations (UN), (1992) The Rio Declaration on Environment and Development’, UN Document A/CONF.151/26.